Born in Asheville, North Carolina, Kent was surrounded by his mother’s collection of stoneware pots from the Folk Art Center. In high school, he made his first pot on the wheel, but it wasn't until college that he met Megan. The two dreamed of owning a pottery studio and art gallery. After studying with Elmer Taylor at University of North Texas, Kent and Megan opened their first studio in Canyon, Texas. From 2007 to 2015, Kent built a wholesale pottery business while selling pots in the couple's gallery. At one point he participated in art shows while selling to over 80 galleries around the country. Megan explored different mediums and spread her love of art through teaching. The couple developed their own range of glazes, spending countless hours achieving a wide range of colors and finishes. Some of these glazes even contain local Panhandle clay. 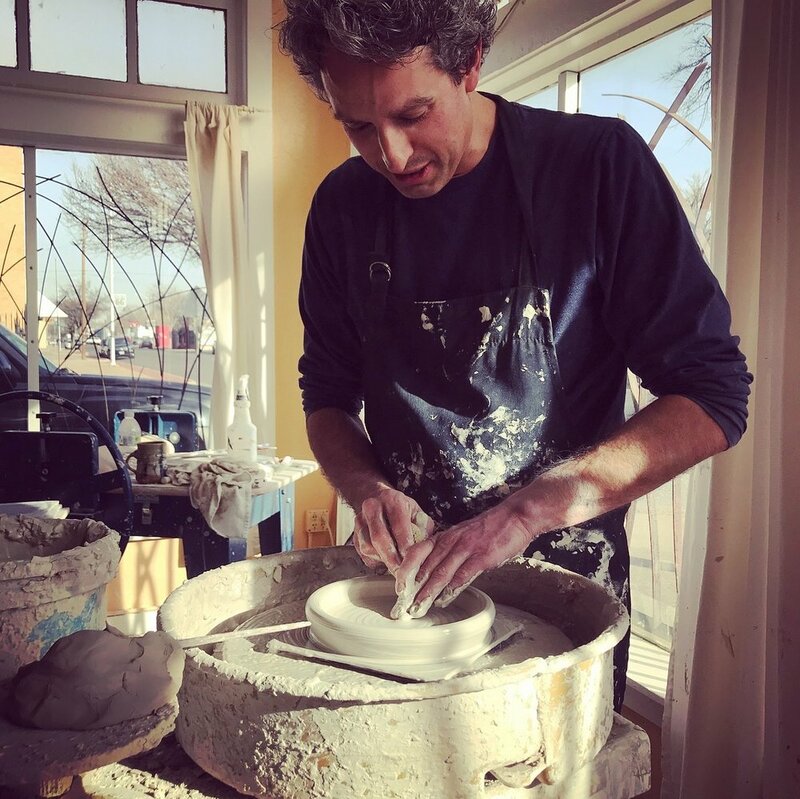 In 2015, Kent and Megan decided to focus more on selling pots directly to people in their gallery and teach classes at the studio. They continue to hone their work and help others discover the joy and beauty of pottery. "Pots made with local materials and a clear purpose can achieve a beauty found most often in nature. The more pots I make, my commitment to local materials grows. The local materials I use include a variety of clays and wood ashes. Preparing local clay-based glazes and washing the wood ash are lengthy processes during which I become more mindful. Using local clays and wood ash glazes also allows me to create pots which reflect the natural beauty of their source, the earth and the trees. ”To throw my pots I use a potter’s wheel. 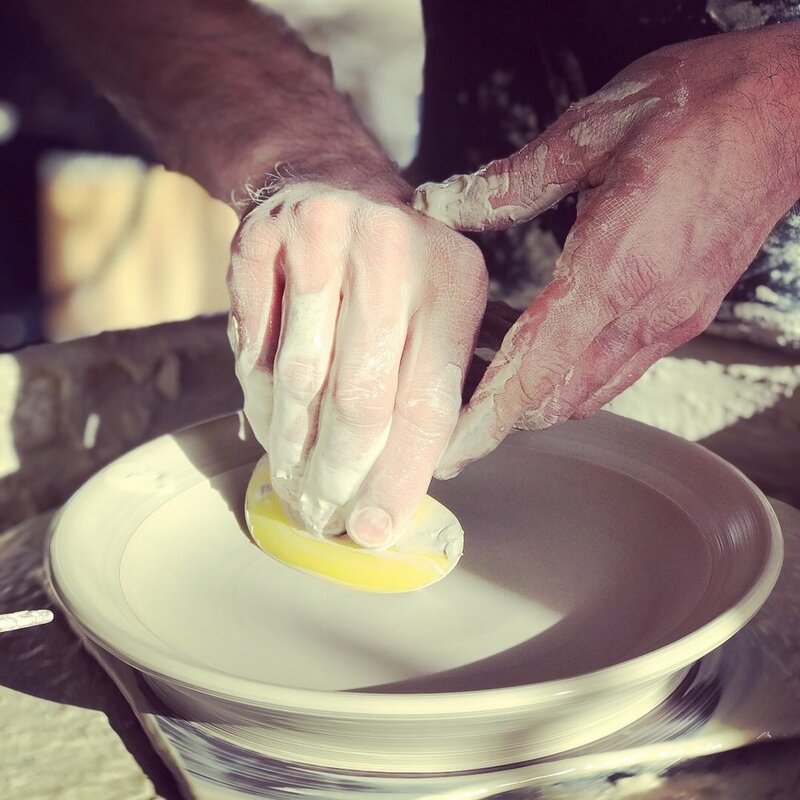 Turning the wheel slowly frees me to leave rhythmic throwing lines in the clay, providing areas where the wood ash glaze will pool. Organic surface decorations achieved by texturing the soft clay create even more recesses for the wood ash to gather. This creates a subtle contrast in translucency. Recently I have also been interested in creating organic surface patterns reminiscent of glacial melt and other natural processes. “I believe my pots are honest and spirited because of my dedication to natural materials and my mindful methods. Because of my reliance on local materials my pottery is unique to the region I dwell. As the pots leave my studio and go on to be used, they continue their life. I sincerely hope that my pots bring great joy to their owners."